Eight is more than enough pups for new mom, Rosie. 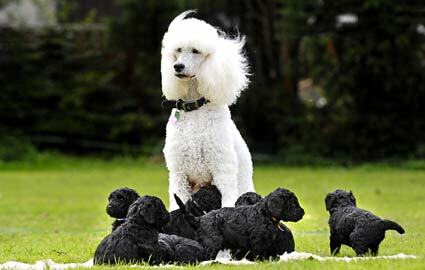 What makes the birth even more special is that despite the white poodle’s lack of pigment, all eight of her puppies have full coats of black hair. The litter of four male and four female pups was the first for Rosie, whose full name is Sukanto My Fair Lady, writes the Doncaster Free Press. Rosie’s owner, a retired nurse named Carol Marsden, delivered the first three puppies at home before Rosie’s breeder arrived to help for the remainder of the seven-hour delivery. The eight puppies take after their father Alfie, a black pedigreed poodle whose official name is Kertellas on Easy Street at Montravia. The boy pups have been named Duke, Leo, Shadow and Victor, and the female puppies Belle, Duchess, Lucy and Tess. “I’ve had that happen,” McFadden tells Paw Nation. “I had a white champion poodle give birth to eight black puppies when she was bred with a black male poodle and it was kind of amusing to see.” McFadden, who’s been breeding poodles since the 1980s, knew it was a possibility because her white poodle had a black poodle in its lineage, and the black male poodle had a white poodle in his lineage. “It makes for awfully cute pictures, I’ll tell you that,” laughs McFadden. We’ll say!